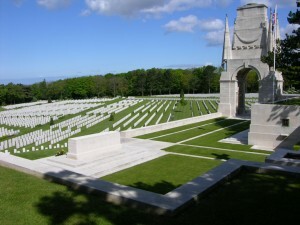 Bleue Maison Commonwealth War Grave Commission cemetery is situated within the community of Eperlecque, Pas de Calais. The cemetery, made in spring 1918 to be a final resting place for the dead from a group of Casualty Clearing Stations in and around Watten. Situated a short distance from the main St. Omer/Dunkerque road is where 60 casualties of WW1 and one unidentified casualty of WW2 now lie surrounded by fields of corn. Bleue Maison is a small place compared to other cemeteries in France and Belgium, but sometimes these are more personal. While the vast numbers of white stones in the larger cemeteries show how horrific war could be, this small cemetery, close to a small road and surrounded by fields can, like other small places can be left out, while the bigger, more well known get all the glory. But not this time! Let’s take a little walk around and see who is there! 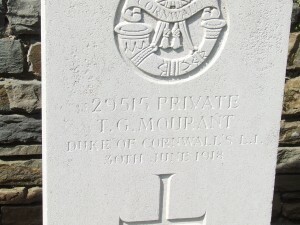 Thomas George Mourant – Thomas was the son of Thomas Mourant and his wife Eliza. In the census of 1911 the couple had been married 15 years and Eliza had given birth to three children, two of which had survived to be named in the census – Thomas aged 14 and his younger sister, Violet who was only three. Thomas snr, a house carpenter, was born in St. Clements, Jersey, while his wife was born on mainland UK in London. Thomas jnr, was born in Grourville(? 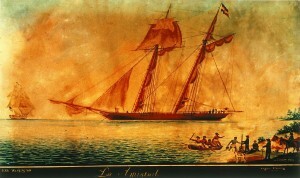 ), while his sister was born in St Martins. In this census the family of four were living at Percy House, Gorey, Jersey. During the Great War, Thomas served in the Duke of Cornwall’s Light Infantry, as Private 29515. He enlisted in Grouville, the place of his birth and had previously served as no. 172 in the Royal Jersey Garrison Bn. Thomas, like all other Jersey men, volunteered to go to war, as Jersey and the other Channel Islands did not call-up their young men. 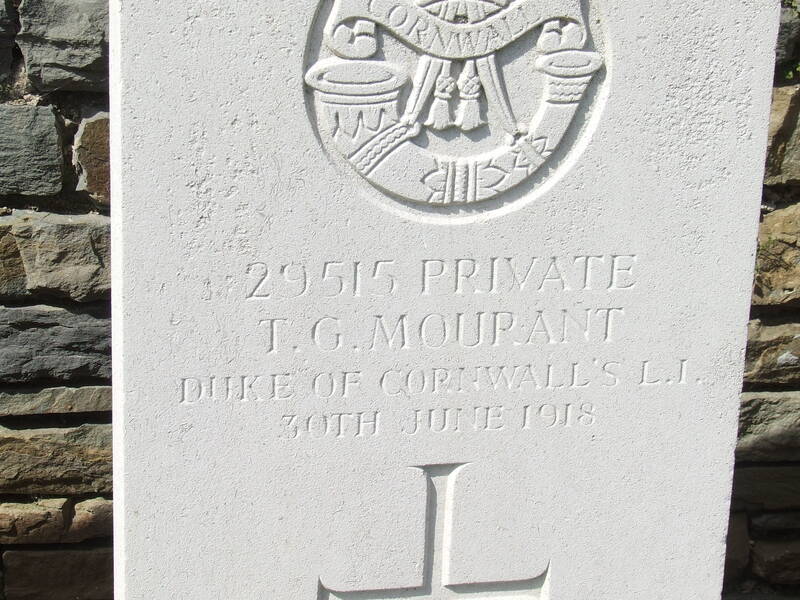 Thomas George Mourant died of wounds on the 30th of June 1918. He had been one f over 6,200 Jersey men who served in HM Forces and one of 862 who were either killed in action or died of wounds. His entry in the Army Register of Soldiers’ Effects, tells that monies due to him were paid to his father and had all been finalised by the end of 1919. Arthur Duncalf – Arthur, born in 1898, was the son of Arthur and Charlotte Duncalf, who in 1911 lived at 3 White Street, Widnes. Arthur snr, worked a local soap works. Arthur enlisted in Lower Bebington, joining the Royal Engineers and becoming Sapper WR/334538 and served in the Inland Water Transport battalion. Arthur died on the 21st of August 1918 aged 21. The extract below gives us a little more information about Arthur – especially the fact that he drowned whilst on active service only a few months after joining the RE’s. The information also tells that he was previously buried in the small churchyard in Watten before being moved to Bleue Maison. It seems that he was liked by many, and that can’t be a bad thing, can it? Edward Ernest Setchfield – His entry in Soldiers Died in the Great War, tells that Edward was born in Emneth, Norfolk, and that he enlisted in Norwich. The Army Veterinary Corp., had Edward listed as Private SE/7275 and he died on the 19th of September 1917 age 37. Edward had married Rose Adamson in late 1901. By the time of the 1911 census Ernest and Rose were living in Wolsoken, with their two children at 40 Elizabeth Terrace. Ernest worked as a coal porter to support his family. Looking a little further into the surviving records, the Register of Soldiers’ Effects sees all Edwards effects finalised by 1919. But one thing that is noted, is how he met his death. 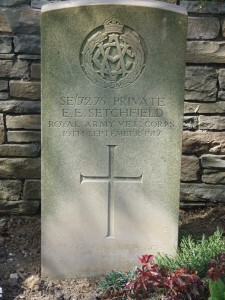 Edward Ernest Setchfield is noted as being accidentally drowned in France or Belgium. Edward rests in a sheltered, shady corner in what is quite an open cemetery. This entry was posted in General, News on July 28, 2015 by carol. Mail Online – Did your ancestors own slaves? The Mail Online has an article informing its readers of a new database containing the names of 46,000 Brits who received compensation on the abolition of slavery. The brief article tells of a few household names whose family were in receipt of part of a portion of £20million. These names include David and Samantha Cameron, Benedict Cumberbatch, Ben Afflick and Ainsley Harriott, whose great-great-great grandfather, James Gordon Harriott, was the descendant of a line of slave owners. Going back in time, John Gladstone, father of prime minister William Gladstone, owned nine sugar plantations – British Guiana and Jamaica – of which compensation ranged from £2074 to £22443. In one of my earlier blogs I told you about, Guy Victor Baring, who is the related to Alexander Baring, 1st Baron Ashburton, and other members of the Baring family who are on the database – and if you visit the blog about Guy, you will find he is distantly related to me. The Baring family of bankers and investors had between them a number of plantations, with the numbers of slaves varying from 9 to over 320. Their plantation names included:- Fuller’s Rest; Spring Garden; Cotton Tree; Belair and Philadelphia. The Lascelles family of Harewood House, also had property in Barbados and were entitled to money from the fund. The database is can be found on the Legacies of British Slave-ownership website is a project based at the University College London. The informative site, has information about the project and a blog – a little sparse in its content, but what is there is interesting. The search area is well thought out and depending on your research criteria, there are three sections:- Individual’s Details (including name, occupation, religion and more); Address Details and finally, Claim Details (including claim number; Estate; Parish; Claimant Category along with compensation details and number of enslaved). There are two estates indexed that have over 550 enslaved – John Blackburn, a Glasgow merchant whose estate was in Jamaica and James Henry Mitchell, a gentleman, of Heath House, Oxfordshire, who also had estates in Jamaica. Recently, I found a link to a fascinating interactive map on Slate.com, who had an article The Atlantic Slave Trade in Two Minutes. The map in 2 minutes shows 350 years of the slave trade and includes 20,528 voyages, equating to millions of lives. The map counts up, showing the voyages year by year, ending in 1860. Some of the years are quite shocking in the number of journeys that took place. When playing the map, it interesting to see that North America has less voyages than the Caribbean and countries in South America (mainly Brazil). 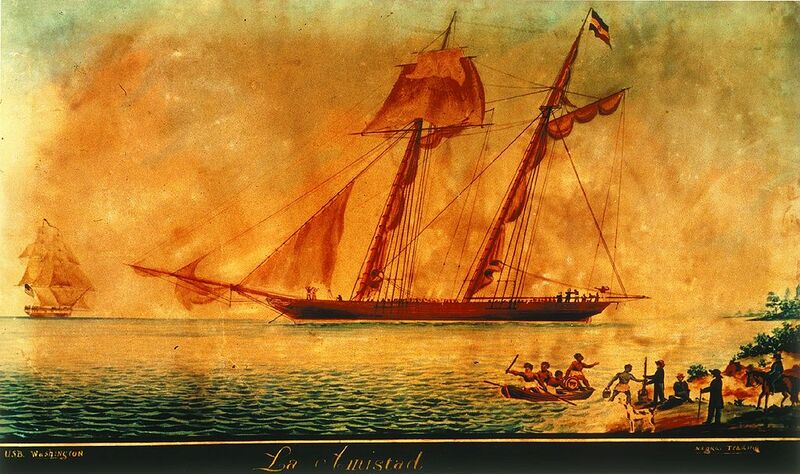 Another site, also with a link found on Slate.com’s site is The Trans-Atlantic Slave Trade Database which list details of 1,000’s of voyages and includes details of ownership, captain and journeys. Also on the same site, is the African Names Database lists 1,000’s names, with physical details i.e. height, age, arrival year, where they embarked and disembarked including a link to African Origins. On Wednesday 15th of July, 2015 on BBC2 at 9pm there is a documentary entitled ‘Britain’s Forgotten Slave Owners’. Historian David Olusoga will, in the first of two programmes, discover the cost of the abolition of slavery. The short series will also who who it was that owned slaves, and not always who you would think. There were many people including: shopkeepers, clergymen and the ordinary 18th century middle class. This entry was posted in General, News on July 12, 2015 by carol. Over 90,000 people volunteered for the British Red Cross at home and overseas during the Great War, they provided vital aid to naval and military forces and cared for the sick and wounded. 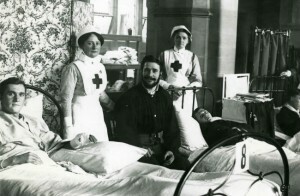 County branches of the Red Cross had their own Voluntary Aid Detachments (VADs) made up of both men and women. 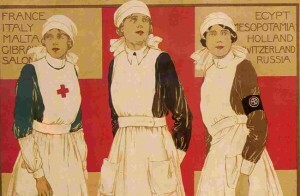 The VAD’s work included such jobs as nursing, transport, rest stations, working parties and auxiliary hospitals. They ran libraries, did air raid duty, and a service that is still being used today – Missing and wounded service. Did you know that Agatha Christie, volunteered for the Red Cross before publishing her first novel in 1920 and worked in a Torquay hospital. 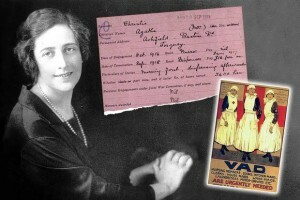 Vera Brittain, famous for her ‘Testament of Youth’, joined the VAD in 1915 and by 1917 was working in France. Enid Bagnold, of National Velvet fame served in London. Did you also know that E M Forster, novelist, critic and essayist, was a pacifist and instead of fighting he worked with the Red Cross. Deaths – even though the VADs were non-combatant, they suffered many deaths. 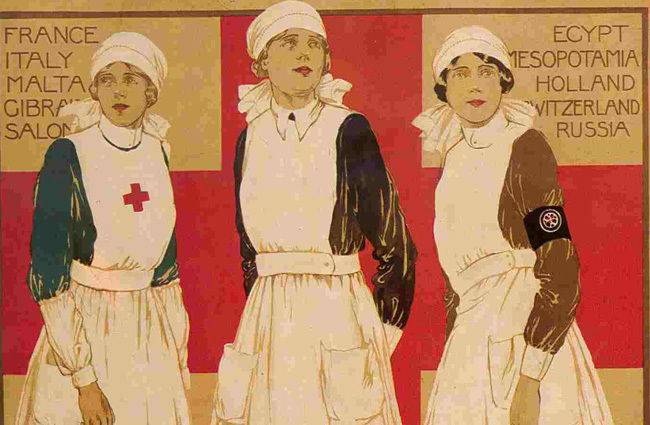 During the war, 128 nursing members and over 100 other VAD members not all directly working for the Red Cross died or were killed. The Roll of Honour contains records of the deaths of 498 Joint War Committee members. This figure includes 8 VADs who died as a result of the sinking of the SS Osmanieh on 31 December 1917. The vessel was contracted by the British navy and was struck by a mine laid by the German submarine UC34 and sank, killing 199 people. They are remembered at the Alexandria (Hadra) War memorial cemetery. The most common cause of death of the VADs was pneumonia caused by Spanish flu. An obituary in the Red Cross Journal, 1918 stated that: “Miss Elger died on February 10th from pneumonia following influenza… For two and a half years she was a devoted and conscientious worker at Clayton Court Hospital, where her loss is felt most keenly by all who knew her. Clayton Court, it will be remembered, was most generously placed at the disposal of the Red Cross by Mr and Mrs Elger early in the war. After doing so much to help their country, it seems hard that they should have to bear this further personal sacrifice”. The VADs who died during the war are commemorated in the great Seven Sisters window in York Minster. The Red Cross has recently transcribed personnel records and at the moment surnames starting with the letters A and B are currently available to search. Volunteers are still working to update the site with more names. One such volunteer was Achsah Bradley of Westbourne, St Andrews Avenue, Morley. Her record card shows that she had originally lived at Denshaw, Morley. Achsah served from March 1917 to January of 1919. Her work as a Special Service Probationer, a pantry worker, was at Roundhay Auxiliary Military Hospital, Leeds, where she worked part time. In total she worked 3,920 hours, which roughly equates to nearly 40 hours per week for her 2 years’ service. There are also a number of wonderful photographs, looking to be identified.………..have a look and see if you know who they are? Another look through the Wakefield Express copies and I came across an entry for a young man who had gained military honours. A WOODLESFORD SOLDIER HONOURED – Sergeant Brittlebank, of the K.O.Y.L.I., writing to a resident says – “I desire to bring to your notice and the people of Woodlesford the honours that have fallen to the lot of Corporal Metcalfe, who has won the Military Medal and the Distinguished Conduct Medal for bravery in the field. I am his Platoon Sergeant, and can personally say he thoroughly deserves the two great honours that have been conferred upon him. The N.C.O’s and men of his regiment feel right proud of him. 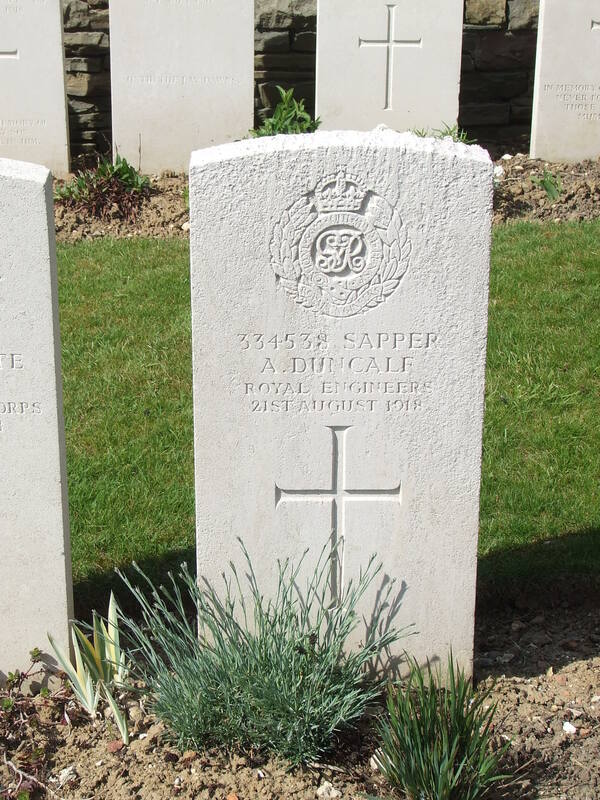 He enlisted in the first rush of war and he served in the Miners’ Battalion of the K.O.Y.L.I., ever since, with distinction and ability both in Egypt and France. Knowing him to be quiet, unassuming young fellow. I think his people and fellow townsmen should know about his honours. I think they have every reason to be proud of him. Again, what do we know about Corporal Metcalfe – well his name, his rank and his regiment, and of course, where he was from! Could this be our Corporal Metcalfe? If it is we now have an initial and a service number. Now to the Medal Card Index with our new found information – his service number! Well, the Medal Card Index entry for Corporal Metcalfe, confirmed by his service number, now tells me his first name was Robert. He now had attained the rank of Sergeant. He was eligible for the British and Victory Medals. But what happened to Robert? Did he make it home? But more to the point who was Robert? Robert was born in Goole around 1894. He was the son of Henry Metcalf and Fanny Welburn, from Carlton. By 1901 the family were living at the Woodlesford Lock, on the Aire and Calder Canal, where Joseph Henry Metcalf, aged 54, was the canal lock-keeper. In the 1911 census there was a Robert Metealfe (Metcalfe), aged 17 who was born in Goole. Robert gave his occupation as labourer in the brickworks. He was lodging with Walter Shorter, a colliery pit sinker, from Kent and his family. A further search for Robert with his service number I found an entry on Soldier’s Who Died in the Great War and found an entry for a Robert Metcalfe, all seemed to fit, but his place of birth is given as Swillington, Garforth. Robert enlisted in Rothwell, he is a Sergeant, in the K.O.Y.L.I. He Died of Wounds on 17th of April 1918, had been awarded the D.C.M. – no sign of his military Medal. The entry for Robert in the Commonwealth War Graves Commission, has his name – Robert Metcalfe (no e), his service number, rank, regiment and battalion, along with his place of burial, Etaples Military Cemetery and plot references XX1X E 10A. He rests with over 10,770 other casualties of war, of which 35 are unknown. Etaples and the surrounding area was dotted with reinforcement camps and hospitals, due to its location – being remote from attack, apart from aerial attack. The area was also accessible by rail, from both the north and the south. In 1917, over 100,000 troops were camped in the sand dunes close to the town, in the hospitals, which included eleven general, one stationary, four Red Cross hospitals and a convalescent depot, could deal with 22,000 wounded or sick. In September 1919, ten months after the Armistice, three hospitals and the Q.M.A.A.C. convalescent depot remained. This entry was posted in General, News and tagged 100 years on July 11, 2015 by carol. I recently attended one of my regular family history meetings. Off I toddled and up on arrival set up my help desk and grabbed a cuppa. I could not remember who the speaker was but when I heard his name, I knew I was in for an interesting morning. The talk was a follow-on from one he gave a few years ago, when he then spoke about the background to conscientious objectors, this talk was to give an insight as to why there were hot-spots of CO’s, where they were and highlight the outcome of a few men. 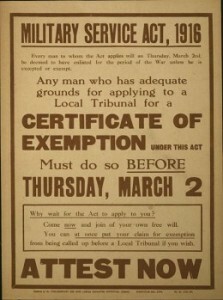 Since his last talk a great deal of work had gone into determining the number of CO’s to the population of men aged between 18 and the early 40 mark, who would have been eligible for conscription. Huddersfield was one of these hot-spots, as was Letchworth Garden City, Nelson and Rawtenstall. My ears pricked up and my eyes opened very wide when a grid with a few local places was shown on the screen. This grid included Huddersfield, Wakefield and Ardsley (East and West). The town of Huddersfield had been highlighted as having a good number of CO’s, but Wakefield, now that was a surprise, only one – I need to find out who he is! But what was a shock, surprise is not good enough for what I was to learn – East and West Ardsley had six Conscientious Objectors. The shock was, that for the population of Wakefield compared to the Ardsley villages, why more than Wakefield? After the talk, there was the usual ‘any questions’. I posed one, as did others, and was invited to have a chat with the speaker after the meeting. I mentioned I had a connection to the Wheeldon family – Alice Wheeldon, had a son William who was a CO, but that story would have to wait. I also mentioned I was curious about the six, who were they? Where did they live? And why were they Conscientious Objectors? After a look through his database of over 17,000 CO’s found so far, I had their names! These men and others had their reasons for not wanting to fight, be it religious, political or some other reason. So, when 1916 came along and brought conscription with it, these men, like many others, chose not to go to the enlistment centre. The men would ignore the call and stay at home awaiting the police to arrest them. Or, they would ‘go on holiday’ as it were and tour rural places either camping or staying in safe houses. The Clay brothers – Sons of Albert Clay and Rachel (nee Rogerson). Albert and Rachel were married in St Mary’s Church, Woodkirk on the 12th of June 1886 after Banns had been read in there and St Michael’s, East Ardsley. Albert was aged 24 a labourer from East Ardsley, the son of Henry, a shoemaker, while Rachel, aged 21, from Woodkirk, the daughter of Samuel, a joiner. Albert signed his name, while Rachel made her mark. Witnesses to the union were Emma Clay and Horatio Thackerah, who also made his mark! By 1891, the couple were living on Bromley Street, Soothill and now had two children, Ernest aged 3 and his brother Hubert who was just one. The census of 1901 came around, the family were now living at Lawns Terrace and all the boys were there, including young Albert who was 10 months old and Isaac. Albert senior, has his brother Isaac living with them. Another ten years down the line and the family are living on Grand View, East Ardsley. Albert and Rachel have now been married 24 years and had 6 children – with the four boys we know of surviving to the census. By 1911 they were all at Grand View, East Ardsley – Albert and Rachel had been married 24 years, had six children and four had lived to be included in the census. Ernest worked as a textile operative, cloth washer; Hubert and Arthur were pit bank labourers and Albert was at school. Arthur Leathley – he was the son of Samuel and Emily Leathley, who in 911 were living with their eight children at The Green, East Ardsley. Samuel was working as a miner, Arthur was a brickmaker and the other boys in the family old enough to work were working at the local pit. James Holmes, the last of our young men, was, in 1911 had been married to Agnes for the last eight years and was the father of five year old Albert Ernest Holmes – their surviving child of two. James was employed by the local Co-op, as their drapery manager. Now it looks like it’s time to make the names real! Starting with the eldest of the Clay boys, Ernest. Ernest by the time the 1911 census came around is registered as a widow and living back with his parents. He married Edith Scott on the 11 of January 1908 at St Paul’s. Morley. At the time of his marriage to Edith, he was working as a burler and living at 32 Melbourne Place, Morley. His wife, 2 years his senior, was the daughter of Samuel Marshall Scott, and living at 15 Cross Street, Morley. The witnesses being Samuel Marshall Scott and Bertha Carlton. Edith died and was buried on the 5th of February 1910 aged 25, in St Michael’s churchyard, East Ardsley. Like all CO’s Ernest would have received in 1916 his ‘call up’ papers. His Attestation Papers are not to be found, probably destroyed by fire or water during WWII. But his name is there on the Conscientious Objectors’ Register 1914-1918. His name, year of birth and address are recorded along with his marital status and occupation. There is also a section for ‘Other CO’s in family’ – very helpful if you don’t know and they are listed in the notes section. Ernest’s entry under the heading Court Martial, 28 September 1916, says he obtained Work of National Importance under the Pelham Committee in a coal mine but he refused to disclose where he worked. 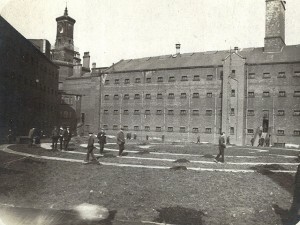 Wakefield prison c1916 possibly with CO’s exercising. Source unknown. Arthur Clay, now his Attestation Papers are available, a little on the burnt side but in most cases the pages are readable, even though some of the dates seem confusing. His form is filled in he usual way for the prospective soldiers – name and address details, occupation and age, but written across one of the sections are the words ‘Refuses to sign declaration’. Below, in the next section it is declared that the recruit has been exempted by a Tribunal on conscientious grounds and written is the date of the Appeal Tribunal (13/3/16) in Wakefield. 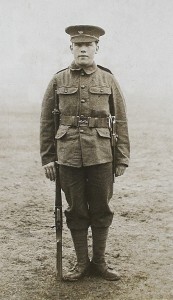 Arthur was appointed to the Non-Combatant Corps. His record papers go on with handwritten notes, including names of other CO’s. The notes tell that he was at Warwick prison, Wormwood Scrubs after being at Dartmoor Works Centre. Further reading through the pages eventually comes up with a Regimental no., of 4685 in the N.C.C. (Non-Combatant Corps.). There is one report where Arthur was in the Guard Room on 1st of June 1918 in Pontefract charged with ‘disobeying a lawful command given by his superior officer’, infront of four witnesses, for which he was Tried and given ‘6 months impt with H.L.’ (6months imprisonment with hard labour) on 9th of June 1918. Arthur was ~Demobbed on 31st of March 1920 and there is a note saying what looks like he is forbidden to wear Chevrons or Wound Stripes. Like his brother, Ernest, his CO Register entry confirms what was found in his Attestation Paper. Albert Clay, born around 1900 in the CO Register, says he was motivated by the NCF (No-Conscription Fellowship), of which he was an Associate Member. Like his brothers he would have been brought before a Committee. Hubert comes next and his Attestation Papers are available, even though they are on some pages a little bit pale and hard to read, like his brothers. Hubert refused to sign and the entry before a Tribunal in Ardsley, on 25 March 1916, says he was exempt from combatant service but given the Regimental number 1685 and the rank of Private. in June of 1916 he was in guard detention room at Richmond Castle, awaiting trial for refusing to obey an order and he was transferred to Durham Prison. Only a few pages are available but still interesting…….now to look at the CO Register, hopefully that will tell more. Hubert seems to have been in prison quite a lot – Pontefract, Richmond for his Court Martial in July 1916 followed by 112 days with hard labour. 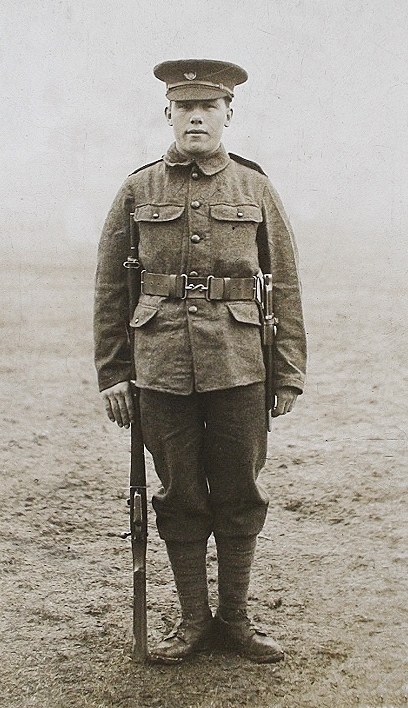 Transferred to Army Reserve, quickly followed by a Court Martial at Leicester in 1917 – 2 years. Again in Leicester and now August of 1917 he is given 1 year with hard labour. 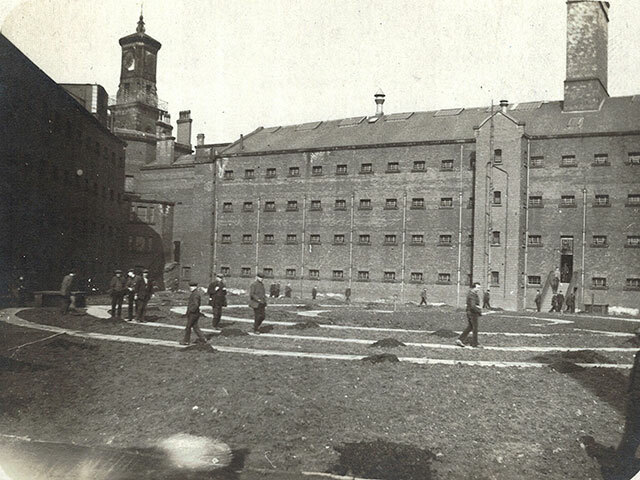 To Wakefield Experiment (what ever that was) then to Armley Prison. In between there were Tribunals at Wormwood Scrubs. James Holmes, born around 1880 lived at the time of his call up at 52 Gordon Street, East Ardsley. He gave his motivation as that of being a regular preacher (minister) in the Church of Christ and a CO therefore claimed Absolute Exemption. Hubert refused to attend a Wakefield Magistrates summons on 30th of April 1917. He was at Pontefract in July 1917 and given 7 days. Later that month he was Court Martialed and given 6 months with hard labour, later ending up at Wormwood Scrubs. Finally, Arthur Leathley, his CO Register entry is similar to the other men from East Ardsley. He was born around 1885 and at the time of his Attestation was living at 11 Gordon Street, The Falls, East Ardsley. Even though his service papers have not survived, the COR tells us that it was 1684. Hubert refused to sign and attended various Tribunals in East Ardsley during the early months of 1916. He was posted to the NCC at Pontefract on 6th June 1916. Later that year he was at Richmond, Court Martialed and given 11 days. He is later to be found in Duha Prison. On the 1st of November 1916 he is in the Army Reserve and re-called on 6th of February 1917. By the 22nd of the month he has gone AWOL, been re-arrested and given 168 hours detention. Soon afterwards on the 15th of March 1917 he is again Court Martialed and given 2 years without hard labour and ends up at Leicester Prison, having been at a Central Tribunal at Wormwood Scrubs during August of 1918. Sometime during his escapades here refused a medical, was arrested for using the railway at Christmas, which led to him being very badly treated and also refused to obey orders. What made these men feel the way they did and take the actions they did? According to many sources, occupations and connections to Unions, Political Social parties and some religious groups are the connections that link them together. Many did serve alongside fighting soldiers, working as stretcher bearers, in the VAD and other voluntary capacities. Many of these men were killed while doing non-combatant work, especially those who were stretcher bearers, as they had to go into the battle and retrieve the wounded and the dying. Some, in fact were very brave men, while not wanting to take another man’s life, they did in fact lose theirs by trying to save life of another. This entry was posted in General on July 2, 2015 by carol.